It seems the trendy place to grab a drink after work this summer isn't a new bar or beer garden. In July, the Philadelphia Zoo launched "Wild Nights," a new happy hour series, and Adventure Aquarium in Camden also hosted a happy hour event last month. Near the end of August, the aquarium will host another "Sips Undersea." At the first event, the theme was sharks, but the upcoming happy hour focuses on a creature far less scary: penguins. 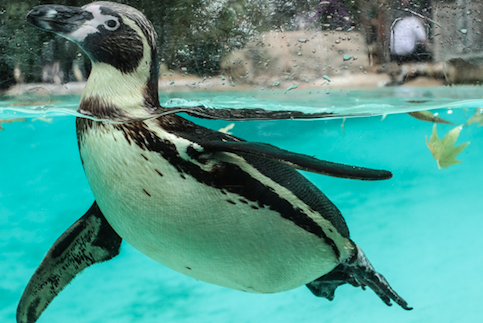 Sip on cocktails outdoors at the Penguin Park exhibit, while watching the aquarium's 40 African penguins play and dive. The first drink is included with the ticket price, which is $20 online and $25 at the door. Penguin Park recently reopened after a year-long refurbishment. If you go to August's "Sips Undersea," try and spot the two penguins named Carson and Nick, named after the Super Bowl champions.